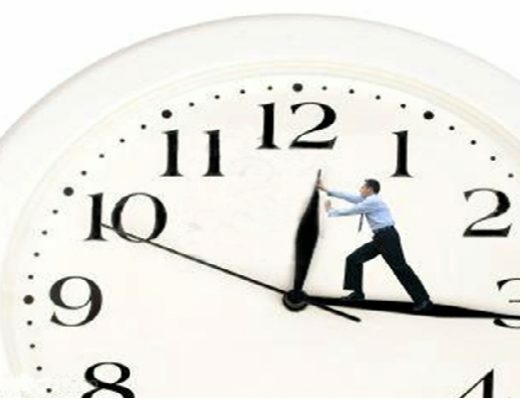 It overcomes the drawbacks of paper based forms like it prone to errors, quickly outdated and as it requires manual data entry that leads to inaccurate data. 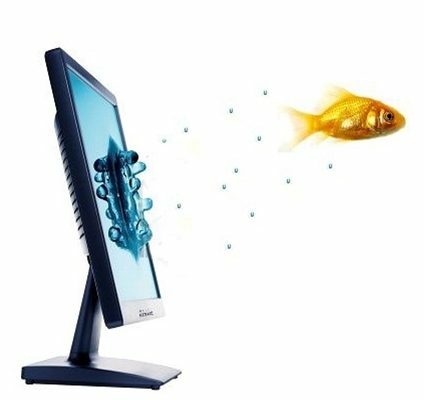 Digital signatures and form certification. These points are enough to make your customer ready to implement Adobe forms in his SAP Systems or Migrate all the SAP Scripts and smart Forms into Adobe Forms (I know many of the Developer will not likes this who are Genius in SAP Script / Smart Forms ). 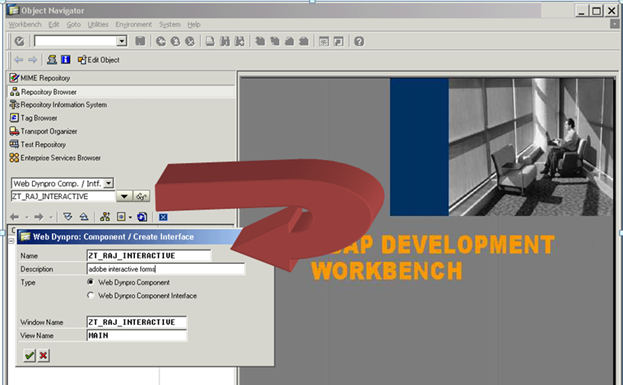 This article will cover the small tutorial about how to make a WebDynpro for ABAP Application with interactive adobe forms. 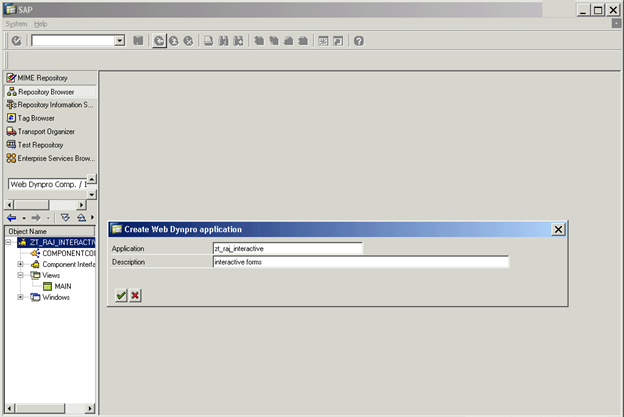 Go to Transaction SE80 and create a Webdynpro for ABAP Application. 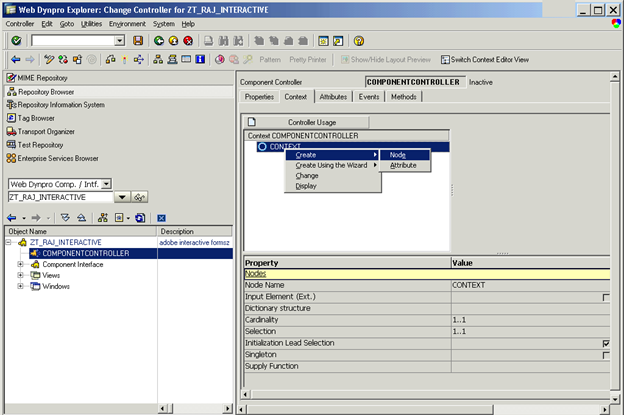 Double click on the COMPONENTCONTROLLER and go to the Context of it. Right click on the CONTEXT and create a Node. 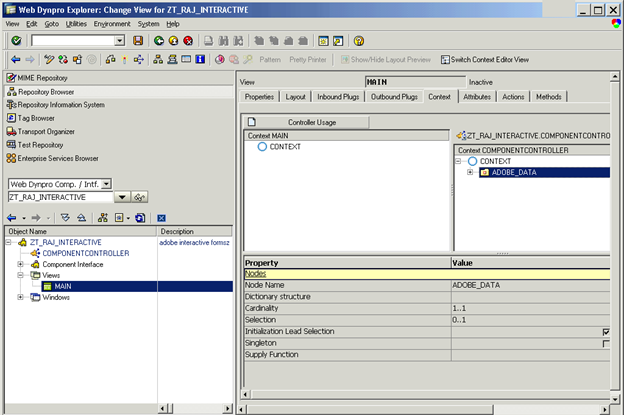 Give the name as ADOBE_DATA, As shown in the below screen Shot. 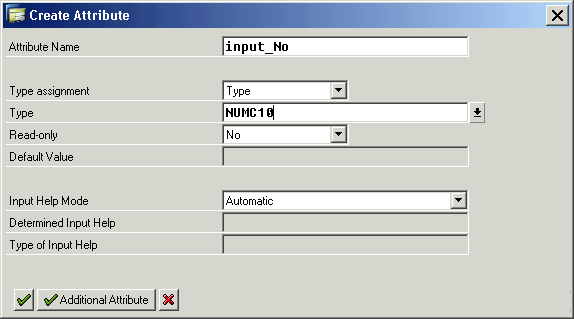 Right click on the Node ADOBE_DATA and create an attribute named INPUT_NO which is of type NUMC10. 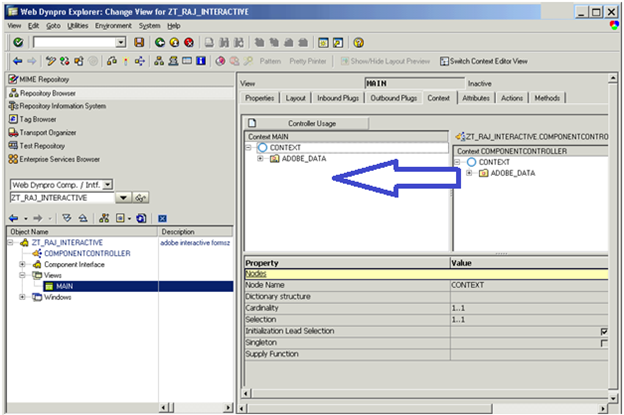 Same way create one more attribute in the same node ADOBE_DATA as OUTPUT_NO of type NUMC10. Go to the MAIN view (Double click on the MAIN view ). 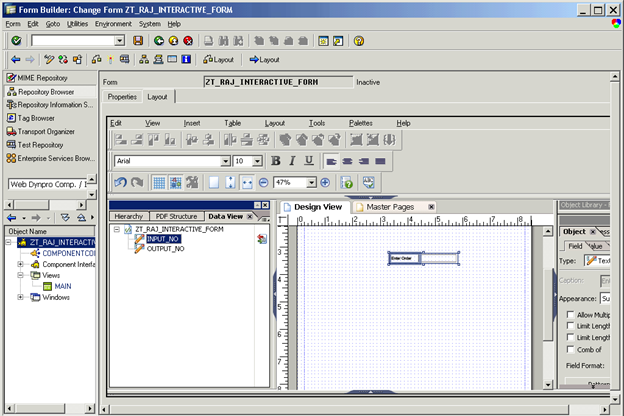 Drag the ADOBE_DATA from the COMPONENTCONTROLLER to the CONTEXT of your MAIN View. 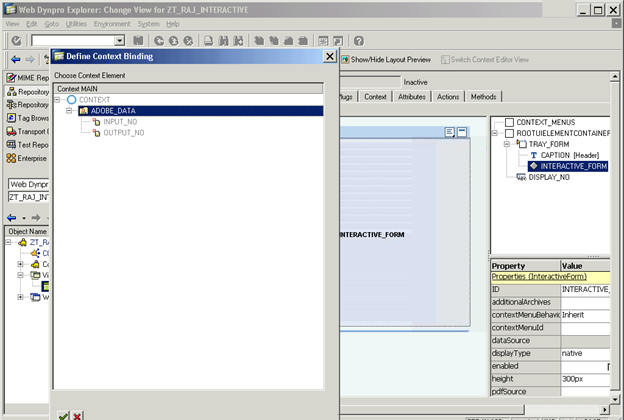 Go to Layout and Right click on the ROOTUIELEMENTCONTAINER and add an element TRAY_FORM of type tray. Double click on the CAPTION and give some Sweet Text like “Interactive Forms ” which you want to Display as a header on Tray. 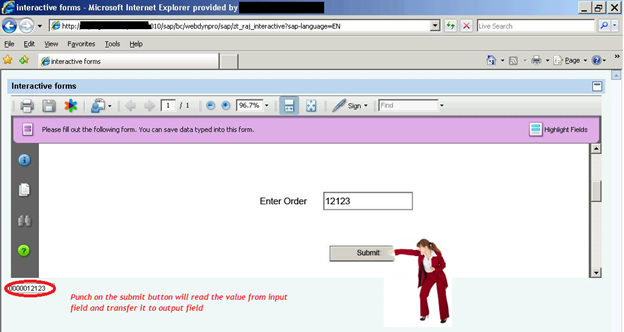 Right click on the Tray you have created and Insert an Element Called INTERACTIVEFORM. Give a name as INTERACTIVE_FORM. Right click on the ROOTUIELEMENTCONTAINER and Inert Element named Display_no which is of type INPUTFIELD. This DISPLAY_NO will be used to display the Number which you enter inside the Form. To do this we need to bind this with OUTPUT_NO of our MAIN view’s context. 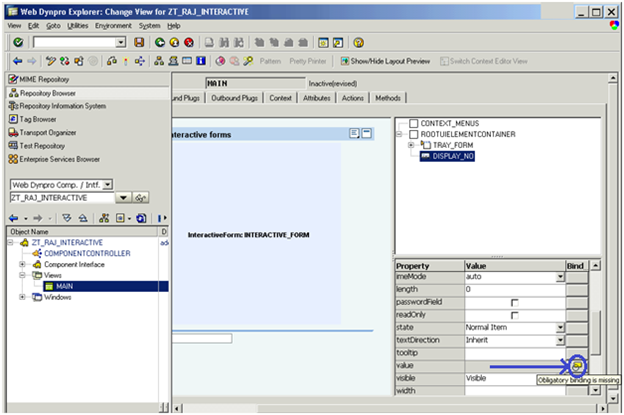 Double click on the DISPLAY_NO UI element and click on the Binding Property of it. 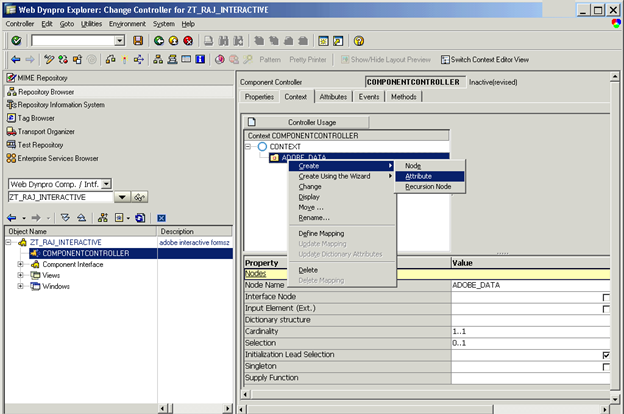 Select the OUTPUT_NO and click ENTER. 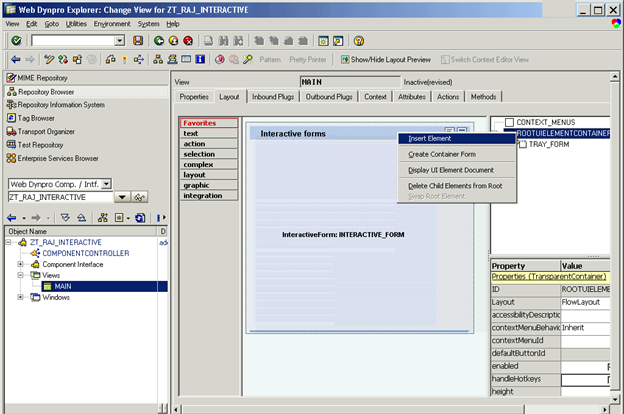 Double click on the INTERACTIVE_FORM. 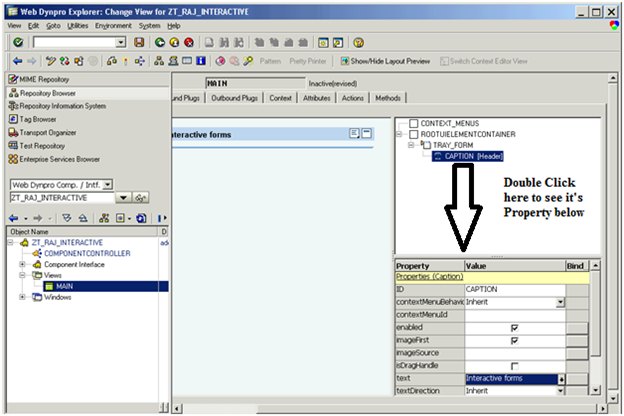 Select the Property “DATA Source” and click it’s right side button to give the data source for our form. 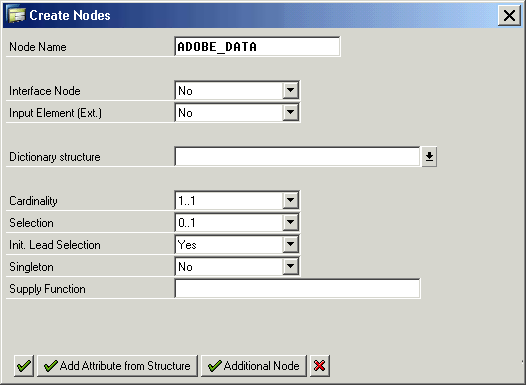 Select the ADOBE_DATA Node and select ENTER Button. Also Check the enabled check Box for it. 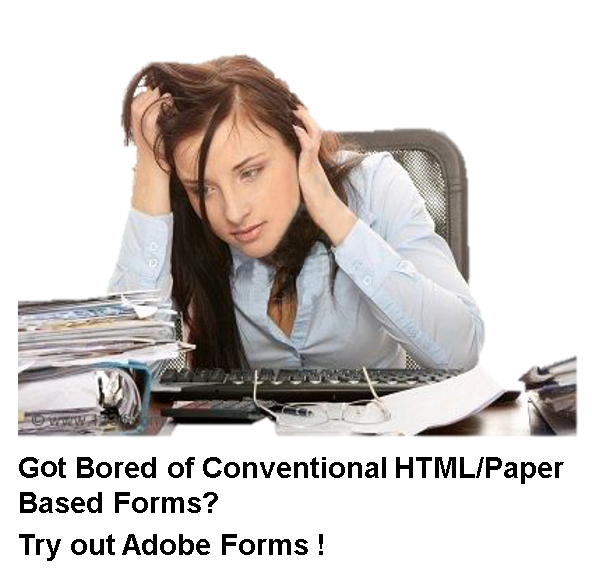 It requires to make the ADOBE Forms interactive. Select it’s Property template Source and Enter any name for your ADOBE FORM. 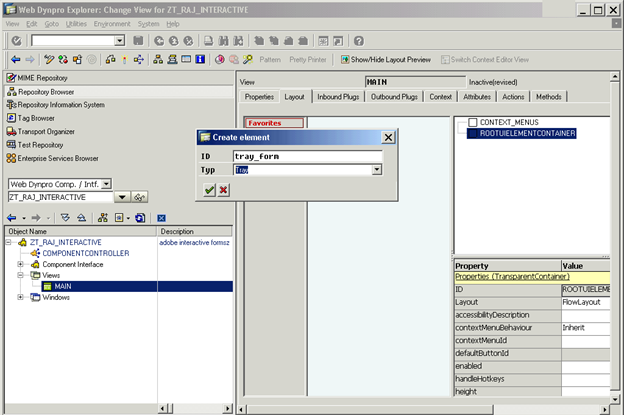 Here we have use name as ZT_RAJ_INTERACTIVE_FORM. Press ENTER. It will ask you the INTERFACE name for it. 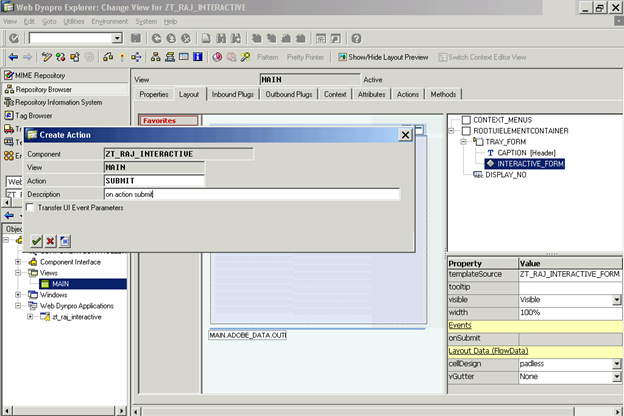 Give name as ZT_RAJ_INTERACTIVE_INTERFACE and click on the button CONTEXT. Select your ADOBE_DATA node and press ENTER. It will direct you to FORM Builder . 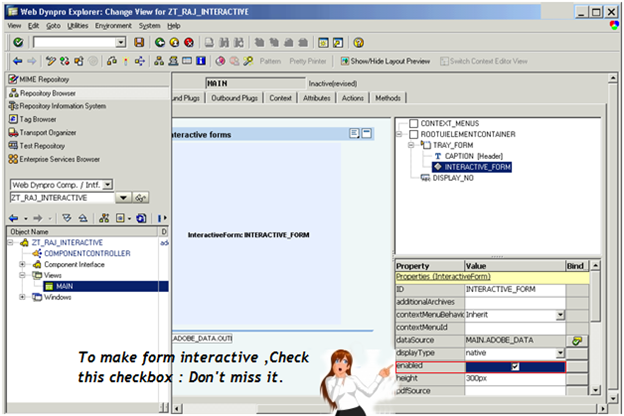 (if it does not start just double click on the INTERACTIVE_FORM in your layout). 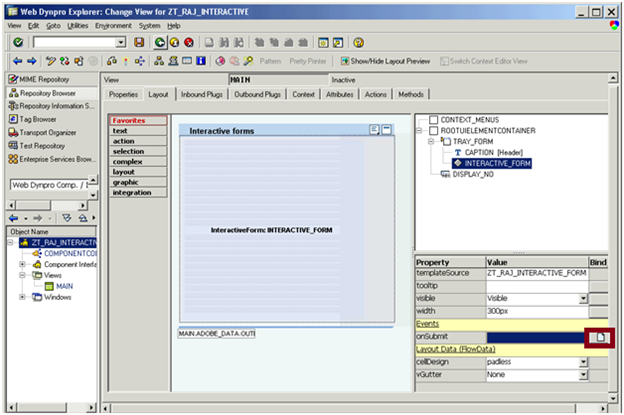 Here you can see the DATA View on the left side with your CONTEXT automatically. 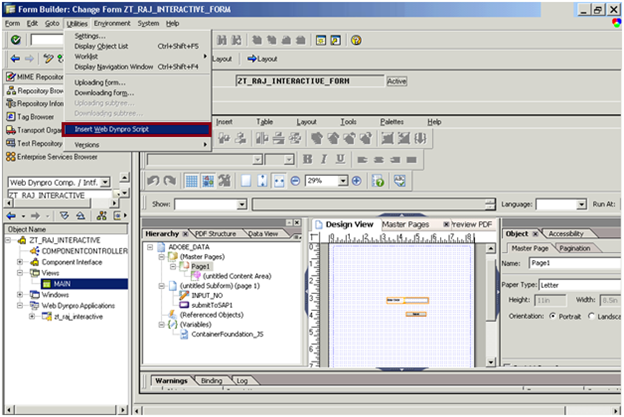 Drag the INPUT_NO and drop it in the Design View. Change the Description of the field according to your wish i.e. Enter Order. As per the requirement we also need one SUBMIT Button. Here we will be using native type of Form so go to the Object Library and SELECT SUBMIT Button. 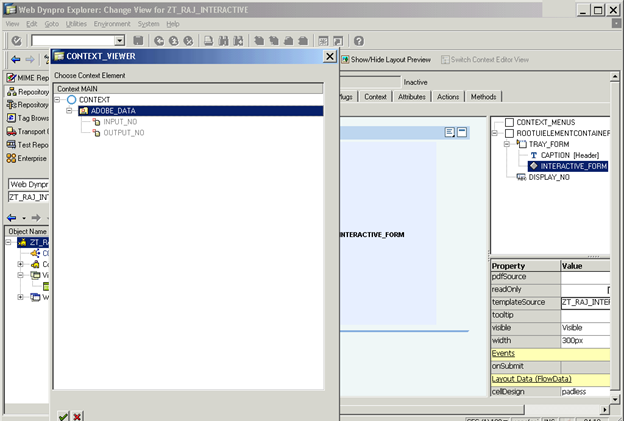 Go to the Property tab of your Form and select the layout as ZCI Layout. Go to UTILITES->Insert Web Dynpro Script. This is necessary to make your INTERACTIVE FORM Visible on your Screen. 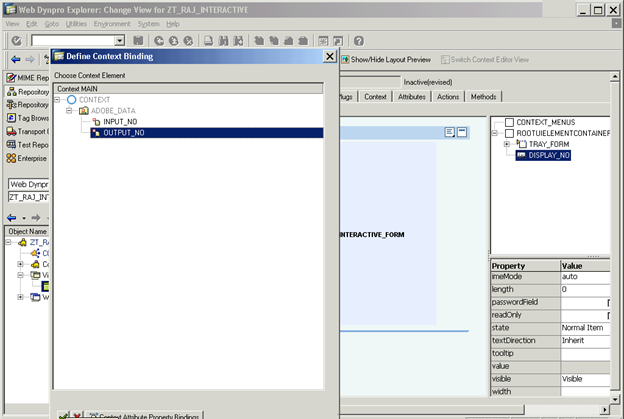 The Button which you have created in your FORM can be linked with EVENT in Webdynpro for ABAP. 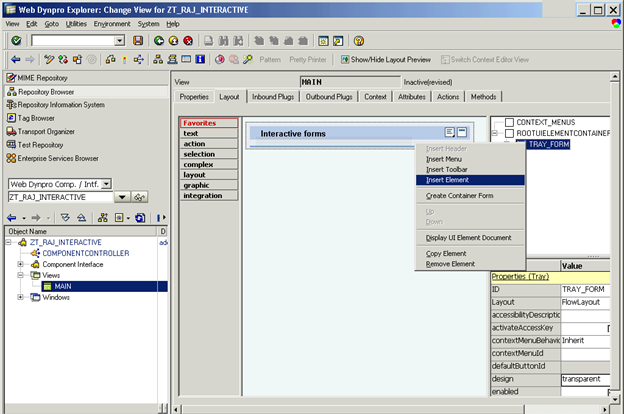 To do this Double click on the INTERACTIVE_FORM and click on the Create ICON which is just beside the OnSubmit Property. IT will ask you the ACTION name .Give the name as SUBMIT.IT will intern create a method called ONACTIONSUBMIT. 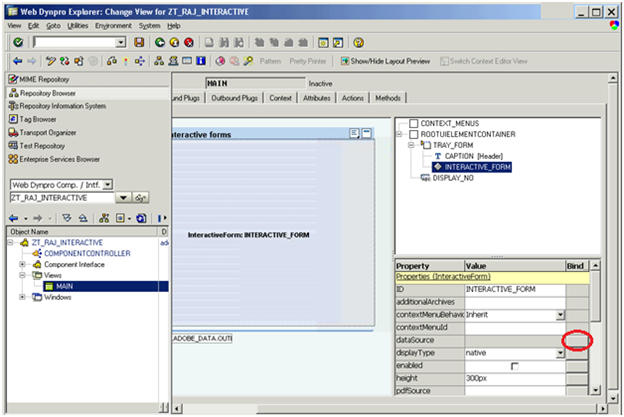 Go to the Methods tab of your MAIN View and Select the method ONACTIONSUBMIT. Put the below code inside it. 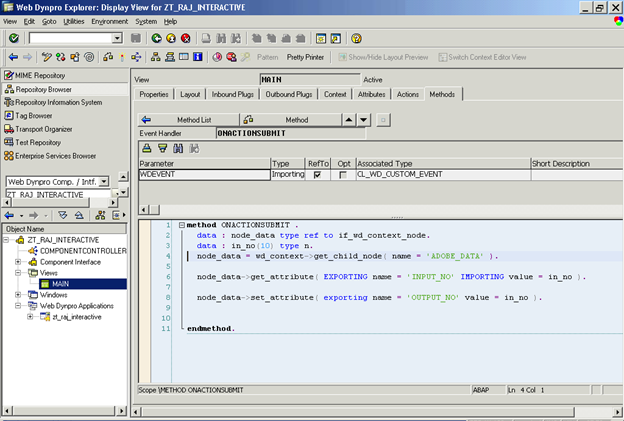 data : in_no(10) type n.
node_data = wd_context->get_child_node( name = ‘ADOBE_DATA’ ). 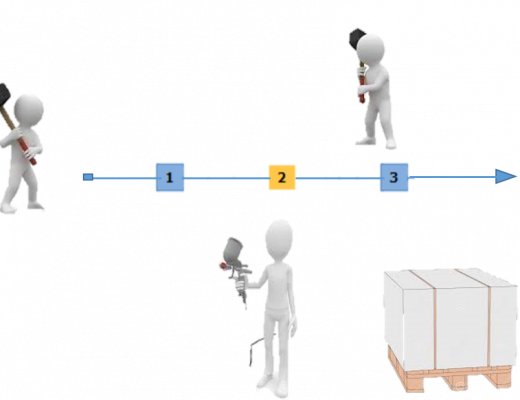 IMPORTING value = in_no ). 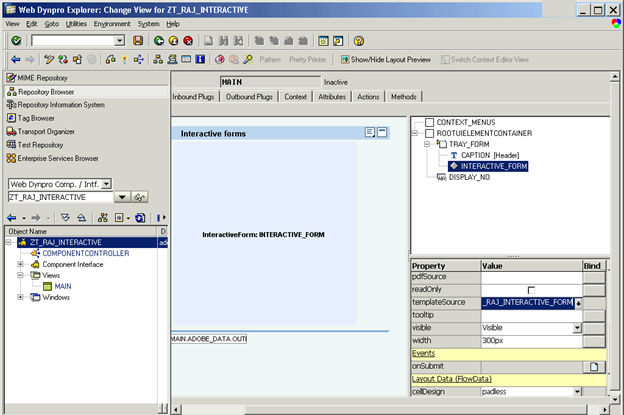 Right click on your Webdynpro Component and create application named ZT_RAJ_INTERACTIVE. 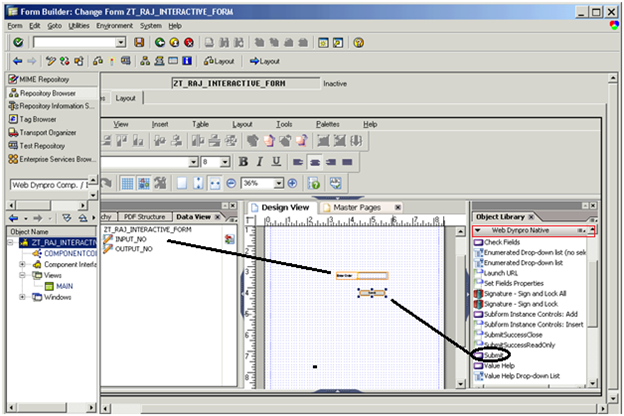 In this step you need to pray that you can see your interactive formJ. 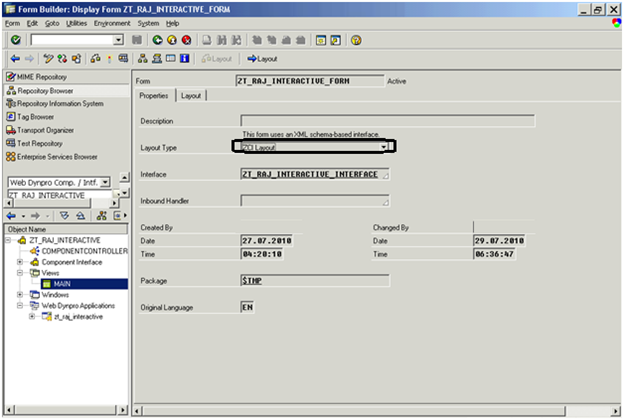 Any way Execute your application ZT_RAJ_INTERACTIVE .Enter the value in the form “Enter Order “field and click on the Submit button. Check the below screen shot.